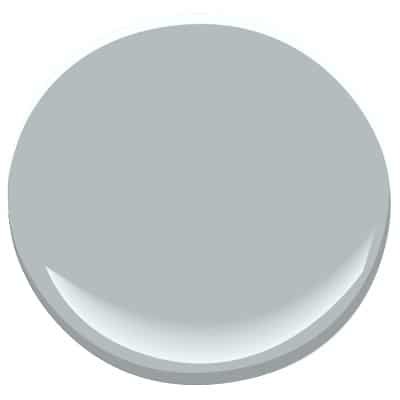 Benjamin Moore Affinity Gray, Greige, Undertones and More! The Affinity line by Benjamin Moore is a collection of paint colours that aren’t often explored by the average homeowner. Why? Well, they are usually overwhelmed with the 1000’s of colours to choose from in the regular line – why look for more? Unless they are a glutton for punishment – like me (wink wink). However, Affinity makes it easy! By honing in on some of today’s TOP neutral paint colours, they have provided designers and homeowners with a handful of exquisite colours to choose from – without the insanity. Metropolitan is a gray that hovers between the light and mid-toned range so that even in a dark room it retains a bit of freshness (not a lot, but a bit). Being a cool gray, Metropolitan could’ve felt icy, with its cool blue, almost purple looking undertone, however, the depth of it and smooth feeling makes it feel fresh, yet intimate. Benjamin Moore Storm AF 700 I love the depth of Storm as it sits right in the mid-toned range without even hinting at a darker current. While it would be a touch heavy for a dark room, as long as your room gets moderate natural light it would hold itself well. Storm is sneaky with its undertones as on first glance it looks like a pretty straight-up gray – however once applied, you’ll notice a kind of storm cloud blue/purple undertone (hence the name) so be wary if that’s not the look you’re going for! If you put it with opposite colours (ie: yellow/orange) you will bring out the purple undertones even more (as opposites attract). You might want to avoid Storm if you have anything in those warm tones including oak and fabrics. When compared to Metropolitan, you’ll see how much warmer and ‘greige’ Thunder appears. Now it’s not that this colour has any yellow or orange (warm tones) popping through, it’s that it almost has a dusky – barely brown/greige undertone which takes the edge off of it (it can feel just a wee touch purple, but not NEARLY as much colour as Metropolitan). If you are looking for a slightly more crisp and fresh gray you may prefer Metropolitan, but if you love grays that are on the soft, feathery side of things then Thunder might be the colour for you! Not as great in a darker, north facing room – feels a touch heavy. Pashmina has an LRV of 43, so it’s got some good weight to it! Kangaroo is one of the darker ‘beige’ paint colours available (without becoming ‘brown’). Kangaroo is neutral, with a soft and subtle warm undertone. Kangaroo has an LRV of 43.25 so it’s not too dark, not too light – it’s juuuust right! Look how light Weimaraner looks on an exterior – exteriors can be tricky! While Weimaraner is in the beige section, in reality, it’s more of a brown than a beige as it sits strongly in the mid-toned range. This brown almost has a grayish feel and you’ll also see a subtle taupe (purple/pink) undertone. Green will bring out the ‘Barney’ in this colour so be careful if you want a more ‘neutral’ approach. I hope you found your perfect paint colour! Trying to find the right warm (on the lighter side, but not off- white) colour for south facing bathroom with espresso cabinets and New Caledonia granite counter which has light grey base with mix of brown, dark grey and black. Floor tile is light mix of taupy grey ,off white, brown slight yellow undertone but grey is dominant. Having difficulty choosing the right undertone, (don’t want pink). Should I be matching counter or floor? Your article on Affinity Neutrals is amazing. I am an owner of the Benjamin Moore store in Penticton, BC and love, love, love your how you have put together your information. I’m going to share your page as it’s full of wonderful ideas. Thank you. Tracy, THANK you – that means a lot coming from you! I do love Benjamin Moore, there is simply on other company who can beat their colours!! Great article! Entertaining and informative. Thank you. You have such a complete understanding of color. Ive been studying color for a long time now & feel like I have had a piece of the puzzle ellude me for quite some time. I do interior design on the side & have taxed my brain over & over again trying to figure out how undertones bring color out and how undertones go together with paint. Honestly, I’ve scoured the internet & books & this and your other posts are my most cherished resources. Youve made the light bulb go off in my head, finally – I feel like my understanding is being made more complete, because of you! Thank you for your intellect, willingness & ability to teach, & your obvious grace & beauty that shines through these blogs! Kristen, seriously…nicest comment EVER!!! Sorry for the delayed reply, I actually found it hovering in my Spam folder – BAH! I am SO glad I found it, what lovely things to say and thank you. While I do love getting questions from my readers it’s really refreshing just to have somebody say ‘thank you’….. I will second that Kristen. Kylie, I have literally run the gauntlet through the Benjamin Moore paint line and I consistently find the best guidance from your site. I have come back again and again and again and again. With over 100 samples tested, and a full house to paint (and I have an art degree….which I thought granted me some wisdom in the area of color), I have literally schooled myself in color over the past couple months. I have so appreciated your blog. THANK YOU! Looking for a wall paint color that will look good with pashmina painted cabinets in a north facing kitchen with little light. Help! Hi Gloria1 When it comes to personal questions, there’s so much more for me to consider like countertop, flooring, quality of light coming in, etc…So, I would recommend you check out my E-design service which is affordable and fun! 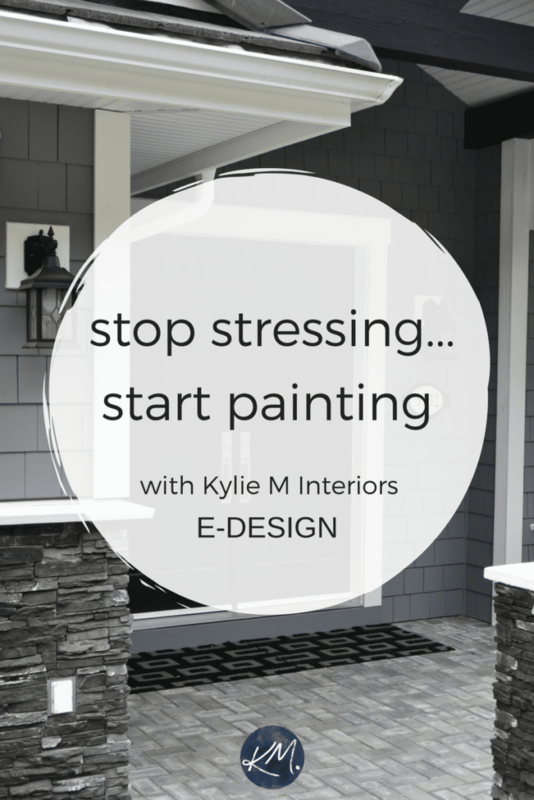 https://www.kylieminteriors.ca/online-decorating-design-services/ This way I can spend some quality time with your room, rather than just guessing. 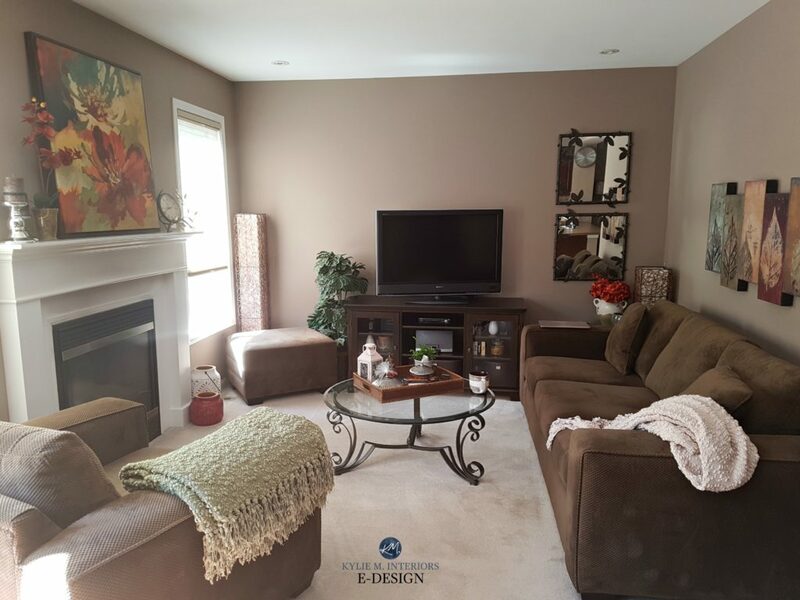 I would love to see a blog post about how to merge the new, more gray-toned color schemes with existing warmer tan/beige/brown color schemes in a home. As a lot of people are trying to update and modernize their existing homes and are not starting from a blank canvas. There are existing elements that need to blend — adjacent/visible rooms painted in warmer tones, upholstered furniture and carpet that doesn’t ‘go’ with gray, and of course cabinetry/flooring, pillows/throws, artwork/accessories … all built around a different palette. Since most of us can’t throw out everything we have and start fresh we need to gradually transition to a newer, more modern look — perhaps starting with paint. Are there ways to blend or combine these tan/beige/brown tones with the newer grays without looking like a hot mess? Any words of wisdom would be greatly appreciated. Thanks! How can I get your services. I have such a challenge with colors right now. Using Martha Stewart calla for trim and cabinets with st. cecilian gold granite., honey oak floors. I really want some gray but do not want it to appear real dark. The kitchen runs into a keeping room with high ceilings. I use brown leather furniture in this room. I know dark beiges look good but have had a lot of that in past and really wanted a drastic difference since it’s so costly to have painted. Thank you, I love your blog. You’re a ha educator and gifted designer. I was looking at your comments on BM Pashmina AF 100. You start the LRV as 29.9 . When I went into BM they sat 43.62. Just thought you’d like to know. Pashmina looks similar in intensity to Kangaroo @42.12.